A local lord needs supplies from a nearby town to rebuild his castle. One problem: that town, Ravenspointe, is under siege by a local colony of hobgoblins. The only way to secure the supplies is to not only drive the hobgoblins away from Ravenspointe, but to take the fight to the abandoned temple in which the foul creatures live. 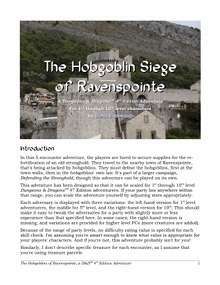 The Hobgoblins of Ravenspointe is a 4-encounter D&D 4th Edition Heroic Tier adventure that's been designed so it can be scaled for 1st through 10th level adventurers. It's the first of a series of campaign modules that can be added to any Heroic Tier campaign. It's designed to be easy to run and easy to drop in to an existing campaign. Moreover, this adventure is part of the larger Stronghold Campaign, begun in The Goblins of Summerkeep. Each monster is presented in three variations, one for 1st level adventurers, one for 5th level, and one for 10th level. As a result, it's easy to tweak the monsters for any party from 1st to 10th level. In addition, each piece of dialogue is presented in two columns: a carefully-written piece of dialogue that you can read as "boxed text," and a detailed summary that you can customize according to your preferred speech patterns. The full-color artwork and maps have been carefully color-corrected to print perfectly on color and black-and-white printers. The module includes maps that will print in standard one-inch squares on a normal piece of paper. This title was added to our catalog on May 31, 2011.